The Georgia Marble Controversy | Who Built Our Capitol? Image courtesy Minnesota Historical Society. Of the different types of stone used to build the Capitol, the most visible is the marble used on the exterior of the building. Quarried in the marble quarries of Tate County, Georgia, Cass Gilbert's decision to use Georgia marble proved to be very controversial. Everyone from quarry workers and politicians, to newspaper editors and cartoonists, wanted the stone used for the exterior to come from Minnesota. Bids for the stone came from various areas of Minnesota-Kettle River sandstone, limestone from Winona, granite from St. Cloud and Little Falls. (1) Governor Clough went on record as being "firmly in favor of Minnesota stone. "(2) Eventually,however, Gilbert's opinion prevailed saying, "It is essential that a building of such proportions should be constructed of material of light color. The use of dark stone (-ie-granite) would inevitably make the build appear gloomy and forbidding", and after deliberations on the part of the Board of Capitol Commissioners, the contract to supply the marble for the building was awarded to the Butler-Ryan Company for $690,000. (3) The Research Team members Randy Croce and Dave Riele traveled to Georgia in October 2012 to film the quarry and talk to present day quarry workers to get a sense of what working in a quarry is like. While there they interviewed a number of individuals, amongst them Frank May, geologist and expert on the marble deposits of Georgia and the history that surrounds them and that interview is displayed here. Also here are clippings from historical newspapers that show the controversy surrounding the use of Georgia marble. And of note is the background image for this website: it is a closeup photograph of the marble on the building. Please be sure and click on the titles of the images to enlarge them and also to use the magnification tools that appear on the bottom of the pdf files to enlarge the newspaper text for reading. 1. Thompson, Neil, B. Minnesota's State Capitol: The Art and Politics of a Public Building. Saint Paul: Minnesota Historical Society Press, 2005, page 33. Bids for the Capitol construction contract from St. Paul Globe June 16, 1897. Capitol Commission considers which stone to use from St. Paul Globe August 31, 1897. 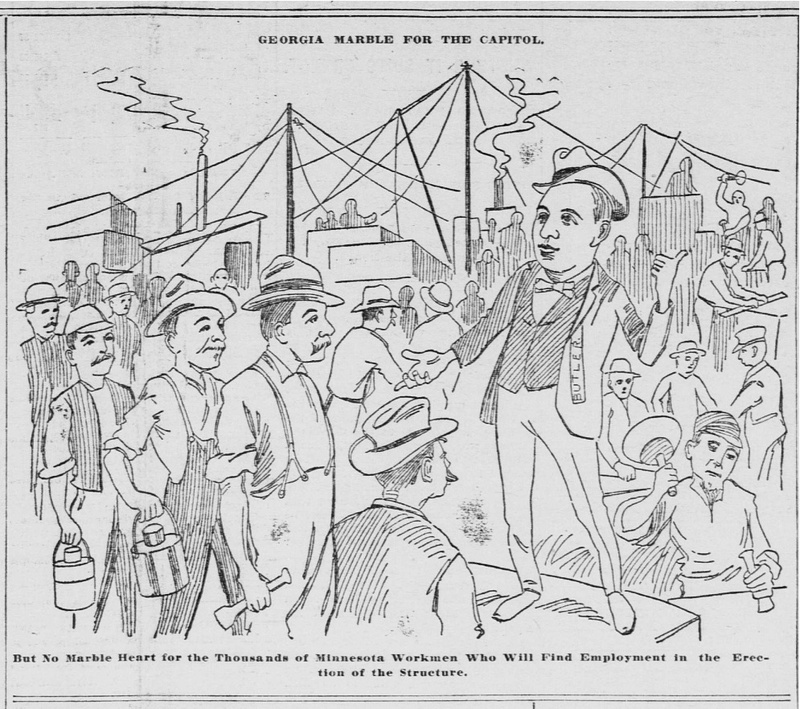 Front page cartoon from St. Paul Globe September 2, 1897. Capitol Marble from St. Paul Globe, September 12, 1897. Attorney General decision re Marble from St. Paul Globe September 14, 1897.